This particular problem also gave me a few nights' worth of wondering why the form would not appear on my Google Sites - hosted website. The instructions were simple enough: create your form at Google Docs, then at Google Sites, Edit the page, then Insert > Spreadsheet Form, then choose from the list. 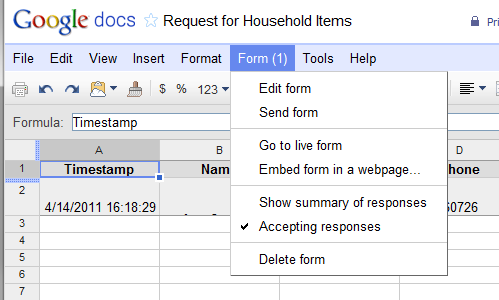 Click on the title of the document at Google Docs home. This will bring up the spreadsheet. Click on Form > Edit Form. Save the spreadsheet, then go back to Google Sites. Remove the non-functioning Form and insert the new one. It should work now. PS. It is good to have at least two browsers in your computer. Logging in to one browser does not automatically log you in to the other browser. So you can check your work in the other browser as seen by a visitor as you go along with your configuration.